Butch Queens Up in Pumpsexamines Ballroom culture, in which inner-city LGBT individuals dress, dance, and vogue to compete for prizes and trophies. Participants are affiliated with a house, an alternative family structure typically named after haute couture designers and providing support to this diverse community. 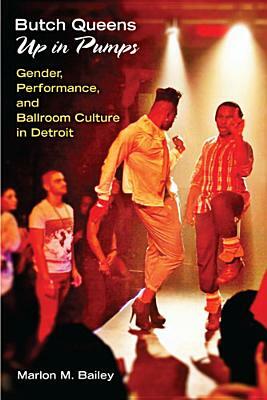 Marlon M. Bailey’s rich first-person performance ethnography of the Ballroom scene in Detroit examines Ballroom as a queer cultural formation that upsets dominant notions of gender, sexuality, kinship, and community. Marlon M. Bailey is Associate Professor of Women and Gender Studies in the School of Social Transformation at Arizona State University.